We may not know exactly when Priyanka Chopra and Nick Jonas will be tying the knot, but the bride-to-be just gave an insight into what her wedding dress will look like. Speaking at an event this week, the actress stressed that she wants to be “cute and comfortable” for her big day. Interestingly, she wasn’t the only person on the red carpet to discuss her wedding dress. 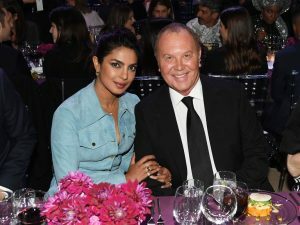 Designer Michael Kors, who was also at the event and had dressed her for the occasion, commented on the actress’ style and what she might wear on her big day, suggesting that he could well be involved in the design. Chopra announced her engagement to Jonas in August after months of speculation. The couple both shared sweet Instagram posts and made their intent to marry official by having a traditional Roka ceremony with their families in Mumbai. These are the cult items of the year.